Ophiomyia cunctata (Hendel, 1820); Spencer, 1990. Host specialization in the World Agromyzidae (Diptera) : 244, 259, 260 (fig. 969), 261. 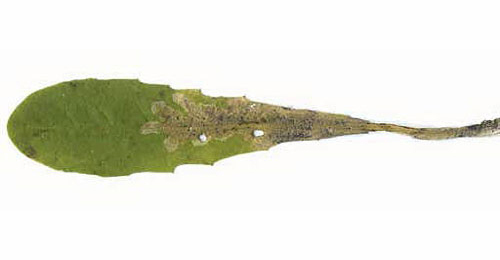 Leaf-mine: A whitish blotch mine along mid-rib, with offshoots into leaf blade. Pupation takes place at the base of the mid-rib (Spencer, 1972b: 25; Spencer. 1976: 63 (fig. 66)). The larva is described by de Meijere (1925: 252 as O. sp. and 1934). Posterior spiracles are on short stalks, each with an ellipse of 9 bulbs (Spencer, 1972b: 25). The larva is illustrated in Bladmineerders van Europa. Yellowish white; posterior spiracles are on short stalks, each with an ellipse of 9 bulbs (Spencer, 1972b: 25). The puparium is illustrated in Bladmineerders van Europa. Comments: Picris echioides is treated as Helminthotheca echioides (Bristly Oxtongue) by Stace (2010). Time of year - mines: July-October. Distribution in Great Britain and Ireland: Widespread in Britain including Kent (Dartford), London (Hampstead), Isle of Wight (Blackgang Chine), Gloucester. (Coombe Dingle), Hertfordshire (Tring), Suffolk (Newmarket), Lancashire (Formby), Dunbartonshire (Bonhill) (Spencer, 1972b: 25); Warwickshire (Coventry, Fazeley Canal and Foleshill) (Robbins, 1991: 123); Cambridgeshire, East Gloucestershire, Glamorgan, Northamptonshire, South Lancashire and South-west Yorkshire (NBN Atlas). Distribution elsewhere: Widespread throughout much of Europe including Denmark, Finland, Norway, Sweden (Spencer, 1976: 62), The Netherlands (Bladmineerders van Europa), Albania, Austria, Balearic Is., Canary Is., Czech Republic, European Turkey, French mainland, Germany, Hungary, Italian mainland, Lithuania, Poland, Republic of Moldova, Slovakia and Spanish mainland (Martinez in Fauna Europaea).